The Helioviewer Project maintains a set of Public APIs with the goal of improving access to solar and heliospheric datasets to scientists, educators, developers, and the general public. Read below for descriptions of each API endpoint and examples of usage. Browse APIs by category using the menu above, or consult the Appendix for more about the available datasources and working with coordinates. For easy access to API responses within your code, check out the open-source libraries available at Unirest.io. Libraries are provided for integration with Python, PHP, Java, Ruby, Objective-C, Node.js, .NET, and Windows 8 code bases. Helioviewer.org and JHelioviewer operate off of JPEG2000 formatted image data generated from science-quality FITS files. Use the APIs below to interact directly with these intermediary JPEG2000 files. Download a JP2 image for the specified datasource that is the closest match in time to the `date` requested. date Required string 2014-01-01T23:59:59Z Desired date/time of the JP2 image. ISO 8601 combined UTC date and time UTC format. sourceId Required number 14 Unique image datasource identifier. jpip Optional boolean false Optionally return a JPIP URI instead of the binary data of the image itself. json Optional boolean false Optionally return a JSON object. By default, JPEG2000 binary image data is returned. This assumes that the `jpip` parameter is omitted or set to `false`. If request parameter `jpip` is set to `true` (and the `json` parameter is omitted or set to `false`) the reponse is a plain text string. If request parameters `jpip` and `json` are both set to `true`, the reponse is a JSON object. uri Required string JPIP protocol link to JP2 image. Get the XML header embedded in a JPEG2000 image. Includes the FITS header as well as a section of Helioviewer-specific metadata. id Required number 7654321 Unique JP2 image identifier. callback Optional string Wrap the response object in a function call of your choosing. <HV_COMMENT>JP2 file created locally at Lockheed LMSAL using hv_aia_list2jp2_gs2 at Wed May 25 02:27:24 2011. Contact Helioviewer LMSAL Franchise (slater@lmsal.com) for more details/questions/comments regarding this JP2 file. HVS (Helioviewer setup) file used to create this JP2 file: hvs_version5.pro (version 5.0). FITS to JP2 source code provided by ESA/NASA Helioviewer Project [contact the Helioviewer Project at webmaster@helioviewer.org][NASA-GSFC] and is available for download at https://launchpad.net/jp2gen. Please contact the source code providers if you suspect an error in the source code. Generate and (optionally) download a custom JPX movie of the specified datasource. startTime Required string 2014-01-01T00:00:00Z Date/Time for the beginning of the JPX movie data. ISO 8601 combined UTC date and time UTC format. endTime Required string 2014-01-01T00:45:00Z Date/Time for the end of the JPX movie data. ISO 8601 combined UTC date and time UTC format. linked Optional boolean true Generate a `linked` JPX file containing image pointers instead of data for each individual frame in the series. Currently, only JPX image series support this feature. verbose Optional boolean false If set to `true,` the JSON response will include timestamps for each frame in the resulting movie and any warning messages associated with the request, in addition to the JPX movie file URI. jpip Optional boolean false Optionally return a JPIP URI string instead of the binary data of the movie itself, or instead of an HTTP URI in the JSON response (if `verbose` is set to `true`). cadence Optional number 12 The desired amount of time (in seconds) between each frame in the movie. If no cadence is specified, the server will attempt to select an optimal cadence. By default, JPX binary movie data is returned. This assumes that the `jpip` and `verbose` parameters are omitted or set to `false`. If the `jpip` parameter is set to `true` (and the `verbose` parameter is omitted or set to `false`) the reponse is a a JPIP-protocol link to the JPX movie as a plain text string. If request parameters `jpip` and `verbose` are both set to `true`, the reponse is a JSON object containing a JPIP-protocol link to the JPX movie plus the timestamps of each frame a message if the value of `cadence` was overridden by the server. message Required string Message describing any values overrided by the server. uri Required string JPIP protocol link to the JPX movie. frames Required List[Number] UNIX timestamps of each frame. If request parameters `verbose` is set to `true` and `jpip` is omitted or set to `false`, the reponse is a JSON object containing an HTTP-protocol link to the JPX movie plus the timestamps of each frame a message if the value of `cadence` was overridden by the server. message Required string An informational message may be included (e.g. if the server overrode the `cadence` parameter). frames Optional List[Number] UNIX timestamps of each frame. Generate and (optionally) download a custom JPX movie of the specified datasource with one frame per pair of startTimes/endTimes parameters. startTimes Required string 1306886400,1306887000,1306887600 Comma separated Date/Time timestamps for the beginning of the JPX movie data. Date and time in Unix timestamps format separated with commas. endTimes Required string 1306886700,1306887300,1306887900 Comma separated Date/Time timestamps for the end of the JPX movie data. Date and time in Unix timestamps format separated with commas. The movie APIs can be used to generate custom videos of up to three image datasource layers composited together. Solar feature/event markers pins, extended region polygons, associated text labels, and a size-of-earth scale indicator can optionally be overlayed onto a movie. Movie generation is performed asynchronously due to the amount of resources required to complete each video. Movie requests are queued and then processed (in the order in which they are received) by one of several worker processes operating in parallel. As a user of the API, begin by sending a 'queueMovie' request. If your request is successfully added to the queue, you will receive a response containing a unique movie identifier. This identifier can be used to monitor the status of your movie via 'getMovieStatus' and then download or play it (via 'downloadMovie' or 'playMovie') once its status marked as completed. Movies may contain between 10 and 300 frames. The movie frames are chosen by matching the closest image available at each step within the specified range of dates, and are automatically selected by the API. The region to be included in the movie may be specified using either the top-left and bottom-right coordinates in arc-seconds, or a center point in arc-seconds and a width and height in pixels. See the Coordinates Appendix for more infomration about working with the coordinates used by Helioviewer.org. Create a custom movie by submitting a request to the movie generation queue. The response returned will provide you with a unique Movie ID that can be used to check on the status of your movie (via `getMovieStatus`) and to download your movie (via `downloadMovie`). startTime Required string 2010-03-01T12:12:12Z Desired date and time of the first frame of the movie. ISO 8601 combined UTC date and time UTC format. endTime Required string 2010-03-04T12:12:12Z Desired date and time of the final frame of the movie. ISO 8601 combined UTC date and time UTC format. [3,1,100,2,60,1,2010-03-01T12:12:12.000Z] Image datasource layer(s) to include in the movie. events Required string [AR,HMI_HARP;SPoCA,1],[CH,all,1] List feature/event types and FRMs to use to annoate the movie. Use the empty string to indicate that no feature/event annotations should be shown. eventsLabels Required boolean false Optionally annotate each event marker with a text label. imageScale Required number 21.04 Image scale in arcseconds per pixel. format Optional string mp4 Movie format (`mp4`, `webm`, `flv`). Default value is `mp4`. frameRate Optional string 15 Movie frames per second. 15 frames per second by default. maxFrames Optional string 300 Maximum number of frames in the movie. May be capped by the server. scale Optional boolean false Optionally overlay an image scale indicator. scaleType Optional string earth Image scale indicator. scaleX Optional number -1000 Horizontal offset of the image scale indicator in arcseconds with respect to the center of the Sun. scaleY Optional number -500 Vertical offset of the image scale indicator in arcseconds with respect to the center of the Sun. movieLength Optional number 4.3333 Movie length in seconds. watermark Optional boolean true Optionally overlay a Helioviewer.org watermark image. Enabled by default. width Optional string 1920 Width of the field of view in pixels. (Used in conjunction width `x0`,`y0`, and `height`). height Optional string 1200 Height of the field of view in pixels. (Used in conjunction width `x0`,`y0`, and `width`). x0 Optional string 0 The horizontal offset of the center of the field of view from the center of the Sun. Used in conjunction with `y0`, `width`, and `height`. y0 Optional string 0 The vertical offset of the center of the field of view from the center of the Sun. Used in conjunction with `x0`, `width`, and `height`. x1 Optional string -5000 The horizontal offset of the top-left corner of the field of view with respect to the center of the Sun (in arcseconds). Used in conjunction with `y1`, `x2`, and `y2`. y1 Optional string -5000 The vertical offset of the top-left corner of the field of view with respect to the center of the Sun (in arcseconds). Used in conjunction with `x1`, `x2`, and `y2`. x2 Optional string 5000 The horizontal offset of the bottom-right corner of the field of view with respect to the center of the Sun (in arcseconds). Used in conjunction with `x1`, `y1`, and `y2`. y2 Optional string 5000 The vertical offset of the bottom-right corner of the field of view with respect to the center of the Sun (in arcseconds). Used in conjunction with `x1`, `y1`, and `x2`. 4 - 2160p (3840 x 2160, 4K or Ultra HD). movieIcons Optional number 0 Display other user generated movies on the video. followViewport Optional number 0 Rotate field of view of movie with Sun. reqObservationDate Optional string 2017-08-30T14:45:53.000Z Viewport time. Used when 'followViewport' enabled to shift viewport area to correct coordinates. JSON response to "queueMovie" and "reQueueMovie" API requests. Re-generate a custom movie that is no longer cached on disk. Once the movie has been successfully queued for regeneration, the Movie ID can be used to check on the status of the movie (via `getMovieStatus`) and to download the movie (via `downloadMovie`). id Required string VXvX5 Unique movie identifier (provided by the response to a `queueMovie` request). format Required string mp4 Movie format (`mp4`, `webm`, or `flv`). verbose Optional boolean true Optionally include extra metadata in the response. A JSON object containing metadata describing a user-generated movie, including its generation status (0=queued, 1=processing, 2=finished, 3=invalid). A JSON object containing metadata describing a user-generated movie, including its generation status (0=queued, 1=processing, 2=finished, 3=invalid) and the parameters used to create it. Download a custom movie in one of three file formats. hq Optional boolean true Optionally download a higher-quality movie file (valid for .mp4 movies only, ignored otherwise). Output an HTML web page with the requested movie embedded within. format Required string mp4 Movie format (mp4, webm, or flv). width Optional number 846 Width of embedded movie player in pixels. Defaults to the actual width of the movie itself. height Required string 820 Height of embedded movie player in pixels. Defaults to the actual height of the movie itself. style="display:block; width: 846px; height: 820px;"
The screenshot APIs can be used to generate custom videos of up to three image datasource layers composited together. Solar feature/event markers pins, extended region polygons, associated text labels, and a size-of-earth scale indicator can optionally be overlayed onto a movie. or `x0`, `y0`, `width` and `height`. By default, the response is a JSON object containing a unique screenshot identifier (`id`) that can be used to with the `downloadScreenshot` API endpoint. Set the `display` parameter to `true` to directly return the screenshot as binary PNG image data in the response. Please note that each request causes the server to generate a screenshot from scratch and is resource intensive. For performance reasons, you should cache the response if you simply intend to serve exactly the same screenshot to multiple users. date Required string 2014-01-01T23:59:59Z Desired date/time of the image. ISO 8601 combined UTC date and time UTC format. imageScale Required number 2.4204409 Image scale in arcseconds per pixel. [3,1,100,2,60,1,2010-03-01T12:12:12.000Z] Image datasource layer(s) to include in the screenshot. events Optional string [AR,HMI_HARP;SPoCA,1],[CH,all,1] List feature/event types and FRMs to use to annoate the movie. Use the empty string to indicate that no feature/event annotations should be shown. eventLabels Required boolean false Optionally annotate each event marker with a text label. display Optional boolean false Set to `true` to directly output binary PNG image data. Default is `false` (which outputs a JSON object). watermark Optional boolean true Optionally overlay a watermark consisting of a Helioviewer logo and the datasource abbreviation(s) and timestamp(s) displayed in the screenshot. JSON response to "takeScreenshot" API requests. Assumes that the `display` parameter was omitted or set to `false`. Set the `display` parameter to `true` to directly return binary PNG image data in the response. Download a custom screenshot (that was generated using the `takeScreenshot` API endpoint). id Required number 3240748 Unique screenshot identifier (provided by the response to a `takeScreenshot` request). Helioviewer.org's solar features and events annotation layer is powered by the Heliophysics Events Knowledgebase (HEK) provided by the Lockheed Martin Solar & Astrophysics Laboratory (LMSAL). Consult LMSAL's HEK API Documentation for more information. Check to see if Helioveiwer.org is authorized to interact with a user's YouTube account via the current browser session. Request authorization from the user via a Google / YouTube authorization flow to permit Helioviewer to upload videos on behalf of the user. title Required string AIA 4500 (2013-12-30 16:00:07 - 2014-01-27 15:00:07 UTC) Movie title. description Required string This movie was produced by Helioviewer.org. See the original at http://helioviewer.org/?movieId=z6vX5 or download a high-quality version from http://api.helioviewer.org/v2/downloadMovie/?id=z6vX5&format=mp4&hq=true Move description. tags Required string SDO,AIA,4500 Movie keyword tags (comma separated). share Optional boolean true Optionally share the movie with the Helioviewer community. Redirect user to YouTube authorization page. Share an existing user-generated movie to YouTube. id Required string y9tX5 Unique movie identifier (provided by the response to a `queueMovie` request). title Optional string AIA 94 (2014-02-26 16:14:25 - 2014-02-27 15:37:49 UTC) Movie title. description Optional string This movie was produced by Helioviewer.org. See the original at http://helioviewer.org/?movieId=y9tX5 or download a high-quality version from http://api.helioviewer.org/downloadMovie/?id=y9tX5&format=mp4&hq=true Move description. tags Optional string SDO,AIA,94 Movie keyword tags (comma separated). html Optional boolean false Optionally output response as HTML instead of JSON. JSON response to "uploadMovieToYouTube" API requests. Get a listing (in descending time order) of the most recently user-generated movies that have been publicly shared to YouTube. Result set is limited to the value requested or default value of the `num` parameter (unless truncated when the date value of the `since` parameter is reached). num Optional number 10 Number of shared user-generated movies to include in the response. Default is 10.
since Optional string Optionally truncate result set if this date/time is reached. ISO 8601 combined UTC date and time UTC format. force Optional boolean false Optionally bypass cache to retrieve most up-to-date data. Find the image data that is closest to the requested date/time. Return the associated metadata from the helioviewer database and the XML header of the JPEG2000 image file. A JSON object containing metadata related to the JPEG2000 image representing the closest temporal match for the specified datasource. date Required string Date/time of selected image. scale Required number Image scale in arc-seconds per pixel. width Required number Width in pixels of source JPEG2000 image data. height Required number Height in pixels of source JPEG2000 image data. refPixelX Required number X-coordinate of reference pixel. refPixelY Required number Y-coordinate of reference pixel. sunCenterOffsetParams Required string FITS header positioning metadata. layeringOrder Required number Relative order for image layer compositing. Return a hierarchial list of the available datasources. Optional parameter `verbose` is exists for compatability with JHelioviewer. It outputs the hierarchical list in an alternative format and limits the list of available datasources to a known set (SDO and SOHO). JHelioviewer may not operate properly if new datasources appear in the feed without a client-side updgrade. To explicitly include new sources, use the optional `enable` parameter. enable Optional string [Yohkoh,STEREO_A,STEREO_B] Comma-separated list of observatories to enable. Output the hierarchical list of available datasources in a format that is compatible with the JHelioviewer desktop client. Request a single image tile to be used in the Helioviewer.org Viewport. Tiles are 512x512 pixel PNG images, generated for a given image scale from the intermediary JPEG2000 image files. Use the `getClosestImage` API endpoint to obtain the desired image identifier for the `id` parameter. id Required number 36275490 Unique image identifier. x Required number -1 Tile position. y Required number -1 Tile position. imageScale Required number 2.42044088 Image scale in arcseconds per pixel. difference Required number 0 Specify image type difference. 0 - Base difference image. baseDiffTime Required number string Date/Time string for Base difference images. 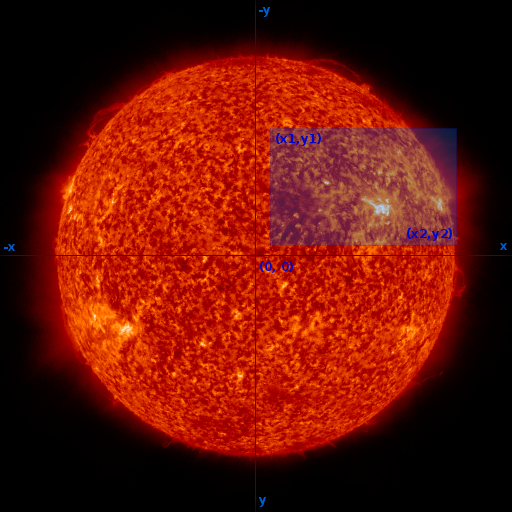 Shorten a Helioviewer.org URL with the bit.ly URL shortening web service. queryString Required string date%3D2014-02-25T15%3A18%3A07.000Z%26imageScale%3D2.4204409%26centerX%3D-410.06307838566283%26centerY%3D-244.6662219973343%26imageLayers%3D%255BSDO%2CAIA%2CAIA%2C304%2C1%2C100%255D%26eventLayers%3D%26eventLabels%3Dtrue URL-encoded query string. Get the XML RSS feed of the official Helioviewer Project Blog. The appendices below provide further context for Helioviewer API usage. Listed below are all valid image data sources hosted by the Helioviewer Project. Reference a particular datasource in your API requests by its 'sourceId' parameter shown in the following tables. The APIs for creating custom movies ('queueMovie') and screenshot images ('takeScreenshot') require that you specify a rectangular region-of-interest (ROI). The ROI defines the field-of-view of the video or image in terms of a zoom level and the location and size of the region. The region-of-interest may be defined in either of two ways. Both methods require an 'imageScale' expressed in arc-seconds per pixel, and atleast one pair of X- and Y-coordinates (expressed as arc-seconds from the center of the solar disk). The first method defines the ROI based on a pair parameters specifying the X- and Y-coordinates for the top-left ('x1','y1') and bottom-right ('x2','y2') corners of rectangle. An alternative method defines the ROI in terms of the X- and Y-coordinates of the center of the region ('x0','y0'), coupled with the total width and height of the rectangle in pixels. Use this method if the pixel dimensions of the output are important to you. The APIs handle the translation between arc-seconds and pixels based on the value of 'imageScale' that you have specified. Smaller values of 'imageScale' will produce results that appear "zoomed-in" to show more detail. You are not limited to creating screenshots and movies at a datasource's native resolution. Each image layer will be scaled to match the imageScale you have requested.